Dwight Eugene "Doc" Gooden (born November 16, 1964), nicknamed "Dr. K", is an American retired professional baseball player. A pitcher, Gooden played in Major League Baseball for the New York Mets, New York Yankees, Cleveland Indians, Houston Astros, and Tampa Bay Devil Rays from 1984 through 2000. Gooden is a four-time MLB All-Star, and three-time World Series champion. He won the National League (NL) Rookie of the Year Award in 1984, as he led the league in strikeouts, and then won the NL Cy Young Award in 1985. While a member of the Yankees, Gooden threw a no-hitter in 1996. When he took the mound in the fifth inning on July 10, 1984, Gooden became the youngest player to appear in an Carl Hubbell's five consecutive strikeouts in 1934. That season, Gooden won 17 games, the most by a 19-year-old since Wally Bunker won 19 games in 1964 and the second most for a Mets rookie, after Jerry Koosman's 19 wins in 1968. Gooden won eight of his last nine starts; in his final three starts of the 1984 season, he had 41 strikeouts and 1 walk. Gooden led the league in strikeouts, his 276 breaking Herb Score's rookie record of 245 in 1955, and also set the record for most strikeouts in three consecutive starts with 43. As a 19-year-old rookie, Gooden set the then-major league record for strikeouts per 9 innings, with 11.39, breaking Sam McDowell's record of 10.71 in 1965. He was voted the Rookie of The Year, giving the Mets two consecutive winners of that award (Darryl Strawberry had been the recipient in 1983). Gooden also became the third Mets pitcher to win the award, joining Tom Seaver (1967) and Jon Matlack (1972). Gooden finished second in the NL Cy Young Award voting, even though he had more NL wins, strikeouts and a lower ERA than the NL winner Rick Sutcliffe. In 1985, Gooden pitched one of the most statistically dominating single seasons in baseball history having the highest WAR in 60 years. Leading Major League Baseball with 24 wins, 268 strikeouts, and a 1.53 ERA (the second lowest in the Live Ball Era, trailing only Bob Gibson's 1.12 in 1968) Gooden earned the major leagues' pitching Triple Crown. He led the National League in complete games (16) and innings pitched (2762⁄3). From his second start onward, Gooden's ERA never rose above 2.00. At age 20, he was the youngest pitcher of the last half-century to have an ERA+ above 200. Gooden's ERA+ was 229; 23-year-old Dean Chance (200 ERA+ in 1964) was the only such pitcher under the age of 25 to do so. From August 31 through September 16, Gooden threw 31 consecutive scoreless innings over 4 games, and through October 2, threw 49 consecutive innings over 7 games without allowing an earned run. The highest "quality start" percentage for a given season was recorded by Dwight Gooden, who had 33 of them in 35 games in 1985. Even in the eleven games when Gooden didn't earn a win, he was still dominant. In September, he pitched back-to-back 9-inning games allowing no runs, but received no-decisions in both games. In his four losses, Gooden allowed 26 hits and 5 walks in 28 innings, with 28 strikeouts and a 2.89 ERA. The Mets finished second in the 1985 NL East, and teammates jokingly blamed Gooden for having lost 4 games, thereby mathematically costing them the division title. That year, Gooden became one of only 14 African-American pitchers ever to win 20 games, the most recent of whom was CC Sabathia. 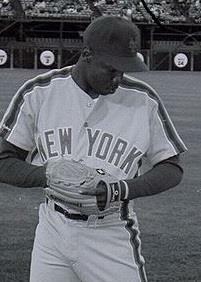 Gooden became the youngest-ever recipient of the Cy Young Award and Pitcher of the Year Award. There was even media speculation about Gooden's Hall of Fame prospects. That November, Gooden turned 21. However hyperbolic that early Hall of Fame speculation appears more than 20 years later, it was a natural extension of Gooden's larger-than-life presence in New York City. Travelers descending the steps of the side entrance to Manhattan's Pennsylvania Station were greeted by an enormous photograph of Gooden in mid-motion that recorded his season's strikeout totals as the year progressed. Likewise, those strolling the streets of Manhattan's West Side could gaze up at a 102 feet tall Sports Illustrated mural of Gooden painted on the side of a building at 351 West 42nd Street in Times Square, whose caption asked "How does it feel to look down the barrel of a loaded gun?" While Gooden would be an effective pitcher for several more seasons, he never again approached such heights. 1985 would prove to be the only 20-win season of Gooden's 16-year career. Many reasons have been offered for his decline: early overuse, cocaine addiction, the league catching on to some of his pitches (notably a fastball that rose out of the strike zone, which hitters increasingly avoided), or the influence of Mets pitching coach Mel Stottlemyre, who convinced Gooden to change his pitching motion in the hopes of prolonging his career. Gooden was the Mets ace going into the playoffs, and his postseason started promisingly. He lost a 1–0 duel with Scott in the NLCS opener, then got a no-decision in Game 5, pitching 10 innings of 1-run ball. He was substantially worse in the World Series against the Boston Red Sox, not getting past the 5th inning in either of his two starts. Nevertheless, the Mets won four of the five non-Gooden starts and the championship. In an early red flag, Gooden no-showed the team victory parade. The game remains one of the great disappointments in Mets franchise history. The 1980s Mets were considered a dynasty in the making; after they underperformed, some looked to this game as perhaps the key moment of the dynasty that wasn't. During the lockout-shortened 1994 season at age 29, Gooden had a 3–4 record with a 6.31 ERA when he tested positive for cocaine use and was suspended for 60 days. He tested positive again while serving the suspension, and was further suspended for the entire 1995 season. The day after receiving the second suspension, Gooden's wife, Monica, found him in his bedroom with a loaded gun to his head. Gooden signed with the New York Yankees in 1996 as a free agent. After pitching poorly in April and nearly getting released, he was sent down to the minors where he worked on his mechanics and soon returned with a shortened wind-up. He no-hit the Seattle Mariners 2-0 at Yankee Stadium on May 14. He ended the 1996 season at 11–7, his first winning record since 1991, and showed flashes of his early form, going 10-2 with a 3.09 ERA from April 27 till August 12. He proved to be a valuable asset for the Yankees that season as David Cone was out until early September with an aneurysm in his shoulder. Gooden signed with the Cleveland Indians in 1998 and enjoyed mild success, going 8-6 with a 3.76 ERA. He started 2 games for the Indians in the 1998 post-season, including one against his former team the New York Yankees, both of which ended in no-decisions. He remained with the Indians in 1999 but did not match his respectable numbers in 1998, going 3-4 with a 6.26 ERA. Gooden never won a postseason game, going 0–4 in the course of 9 postseason starts over eight series. In the 1986 National League Championship Series, however, he had an earned run average of only 1.06 after starting 2 games and allowing just 1 earned run in 17 innings pitched. 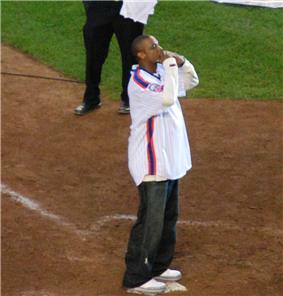 Gooden appeared at the Shea Stadium final celebration on September 28, 2008, the first time he had appeared at Shea Stadium since 2000. On April 13, 2009, he made an appearance at the newly opened Citi Field. Gooden spontaneously signed his name to a wall on the inside of the stadium. The Mets initially indicated that they would remove the signature, but soon decided instead to move the part of the wall with Gooden's writing to a different area of the stadium and acquire additional signatures from other popular ex-players. In January 2010, it was announced that Gooden would be inducted to the New York Mets Hall of Fame. On August 1, 2010, he was officially inducted into the Mets Hall of Fame along with Darryl Strawberry, Frank Cashen, and Davey Johnson. He also threw out the ceremonial first pitch on the same day to Gary Carter. VH1 Network announced June 11, 2011 that he will be a patient for treatment in VH1's upcoming 5th season of the reality show, Celebrity Rehab. with Dr. Drew Pinsky. Gooden was again arrested in March 2006 for violating his probation, after he appeared high on cocaine at a scheduled meeting with his probation officer, David R. Stec. He chose prison over extended probation, perhaps in the hope that incarceration would separate him from the temptations of his addiction. He entered prison on April 17, 2006. On May 31, Gooden said in an interview from prison, "I can't come back here. [...] I'd rather get shot than come back here. [...] If I don't get the message this time, I never will." Gooden was released from prison November 9, 2006, after nearly seven months' incarceration, and was not placed on further probation. On the morning of March 24, 2010, Gooden was arrested in Franklin Lakes, New Jersey near his home there after leaving the scene of a traffic accident, having been located nearby and found to be under the influence of an undisclosed controlled substance. He was charged with DWI with a child passenger, leaving the scene of an accident, and other motor vehicle violations. Gooden has also been charged with endangering the welfare of a child, because a child was with him at the time of the accident. He later pled guilty to child endangerment, received five years probation, and was ordered to undergo outpatient drug treatment. ^ "NL Cy Young Voting". ^ Higbie, Andrea (May 4, 1997). "Young Artist Seeks Brush With Subject - New York Times". Nytimes.com. Retrieved November 23, 2011. ^ "A fading picture | Sporting News, The". Find Articles. November 14, 1994. Retrieved November 23, 2011. ^ "Newspaper Archives – tampabay.com - St. Petersburg Times". ^ Higbie, Andrea (July 16, 1995). "NOTICED; Gooden Is Benched Again - New York Times". Nytimes.com. Retrieved November 23, 2011. ^ "Gooden Pitches No-Hitter as Yankees Top Mariners, 2-0". The New York Times. ^ "Gooden arrested after turning self in on felony charges - MLB - ESPN". Sports.espn.go.com. August 26, 2005. Retrieved November 23, 2011. ^ "Gooden arrested for violating terms of probation - MLB - ESPN". Sports.espn.go.com. March 14, 2006. Retrieved November 23, 2011. ^ "Doc's savior sadly could be time spent behind bars - MLB - ESPN". Sports.espn.go.com. April 6, 2006. Retrieved November 23, 2011. ^ "Gooden says he'd rather be shot than jailed again - MLB - ESPN". Sports.espn.go.com. May 31, 2006. Retrieved November 23, 2011. ^ "Cy Young winner Gooden released from Florida prison - MLB - ESPN". Sports.espn.go.com. November 10, 2006. Retrieved November 23, 2011.